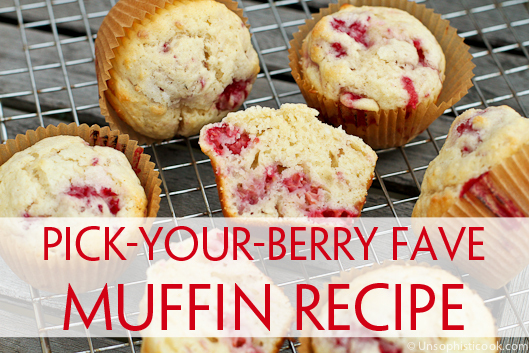 If you’re looking for a low fat muffin recipe, unfortunately, this isn’t the recipe for you. But if you’re looking for a really good homemade blueberry muffin recipe — or raspberry, blackberry, strawberry, etc — this one’s a winner! That’s right, this thick, rich batter can stand up to any of your favorite berries, so if your strawberries are going south, toss them in. Or if you have an overabundance of blueberries, mix up a batch of blueberry muffins. You can even mix and match your berries to taste. I used raspberries for this batch, but whatever berry you decide to use, don’t skip the final step before popping them in the oven. Sprinkle the top of the batter liberally with granulated sugar! I learned this tip as a teenager when I worked at McDonald’s, baking up the muffins every weekend morning. The sugar is what gives the muffins their lovely crunchy, coffee shop-style tops. Try it… I guarantee plain muffin tops just won’t do in the future! Preheat your oven to 400 degrees. Grease two 12-cup muffin tins or line with paper liners. Whisk together 3 1/2 cups of flour, 1 cup of sugar, baking powder and salt in a large bowl. Stir in melted butter. The batter will be very crumbly at this point. In a separate bowl, whisk together buttermilk, eggs and vanilla extract. Slowly add this mixture a little at a time to the butter mixture and stir until combined. The batter will still be slightly lumpy at this point. Toss the berries of your choice with the remaining 1/2 cup of flour. Gently fold the berries and flour into the batter. 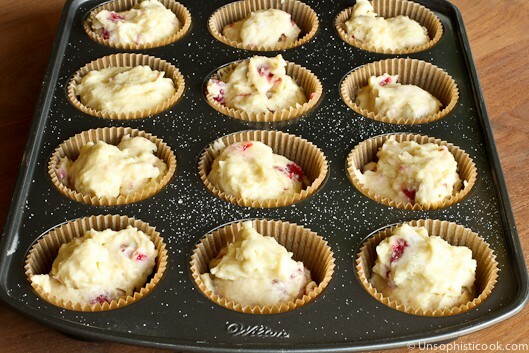 Fill each muffin cup 3/4 full, and sprinkle generously with the remaining 2 tablespoons of sugar. Bake for 18-20 minutes, until a toothpick inserted into the center comes out clean. Cool for at least 10 minutes before removing the muffins from the pan. Follow the instructions for mixing the dry and wet ingredients separately. Be careful not to over mix your batter. It will still be lumpy, and this is fine. Don’t overfill your muffin cups — 3/4 full is the perfect amount. As my youngest will attest, these yummy muffins are best enjoyed fresh! Yes, instead of buttermilk you could stir 1 1/2 tablespoons of lemon juice or white vinegar into just under 1 1/2 cups of milk. Let it stand for about 5 minutes and then you can use it in place of the buttermilk in this recipe. What a great recipe, fun photos too! I love muffins but I definitely need to make them more often! What this isn’t low fat ; ) LOL I absolutely love adding sugar to the tops too! Great tip. Muffins are favorite around here! Love the sugary, crunchy top! yum! can’t wait to try it with different kinds of berries! I was just thinking how I really needed to make a batch of muffins. These looks wonderful. Muffins are a definite favorite around here, too. These look incredible.